I took one look at the paper and my heart sank. I sighed. I knew this would understandably hurt feelings and upset readers. I did not predict, though, that it would yield a Daily Beast article titled “College Paper Prints The Most Racist Front Page in America.” Once this article was published online, the clickbait medium, along with social media, immediately drew attention to what had happened on our campus. Oct. 23, 2015, would have been like any other Friday morning during the academic year, in which I, as faculty adviser to the student-run newspaper Cardinal Points, read and mark up the hot-of-the-presses issue in preparation for my Monday night post-publication critique delivered to the entire staff, except on that morning there were a slew of emails in my inbox and messages on my phone. I did not know about the firestorm that was to come. I did not know that there would be many more email and phone messages from regional and national reporters who wanted to interview me and the student-editors. I did not know about the hate emails that the students on staff and I would receive from people on and off campus. I did not know that administrators and faculty – including journalism professors in my own department – would come down so hard on the newspaper, its student staff, and me. I did not know that I would witness student-editors in utter anguish and tears about the backlash for what the felt was a one-time mistake in the production process, not a malicious act of racism. And I did not know how lonely and difficult it would be to defend students’ First Amendment rights and explain what my professional organization, College Media Association, considers to be a legally and ethically sound best practice for a newspaper adviser – the post-publication critique without mandatory prior review. This article for College Media Review marks the first time I have spoken publicly about what happened. I did not speak with any of the local, regional and national reporters who asked to interview me for a quick sound-bite quote to drop into a story they had already written. And it was suggested to me that I channel interview requests to the college’s director of marketing and communications. Instead, I wanted to tell the whole story under my own terms and in my own words; after all, there was no one closer to it than me and the student-editors. I wanted to let enough time pass so that emotions could subside, then explain how it all went down. In doing so, I would explain how this situation came to be; examine what have been the ramifications for the college, the department, the newspaper, its student-editors, and me as the adviser; outline what structural measures Cardinal Points have taken in the aftermath to regain trust and credibility; and offer advice to my advising colleagues across North America. Covering presidential campaigns can be an “invaluable experience” for student journalists, promoting staff collaboration and providing important content for college media, according toTammy Merrett, who advises The Alestle at Southern Illinois University-Edwardsville, a university with an enrollment of about 14,000 students and about 23 miles from St. Louis. 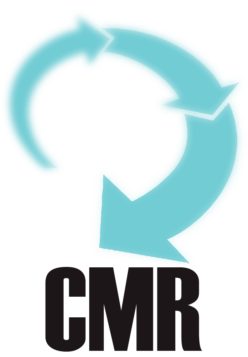 Merrett, a college media adviser with 19 years of student newspaper advising experience, has worked in the field as a professional journalist–both as a reporter and editor–since 1986. Student newspaper advisers and journalism teachers know the difficulties of helping young reporters understand the nuances of objectivity and bias, false balance and fair reporting. We ask such questions as: Do we know our audiences? Are we framing? 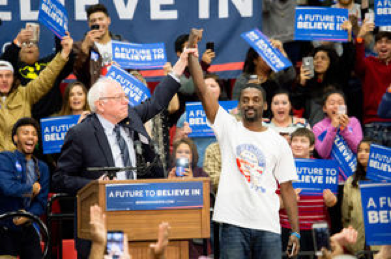 Employing a U.S.-centric or regional slant? Supporting only one side? 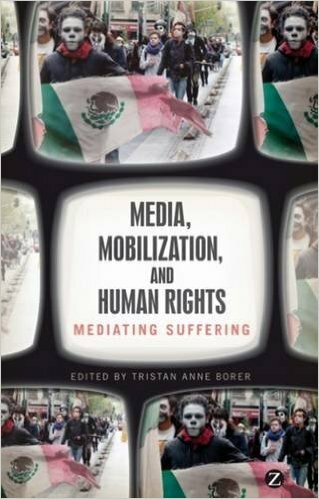 Human suffering is an area of coverage that reporters should consider carefully, and this is the focus of Tristan Anne Borer’s 2012 volume Media, Mobilization, and Human Rights: Mediating Suffering. 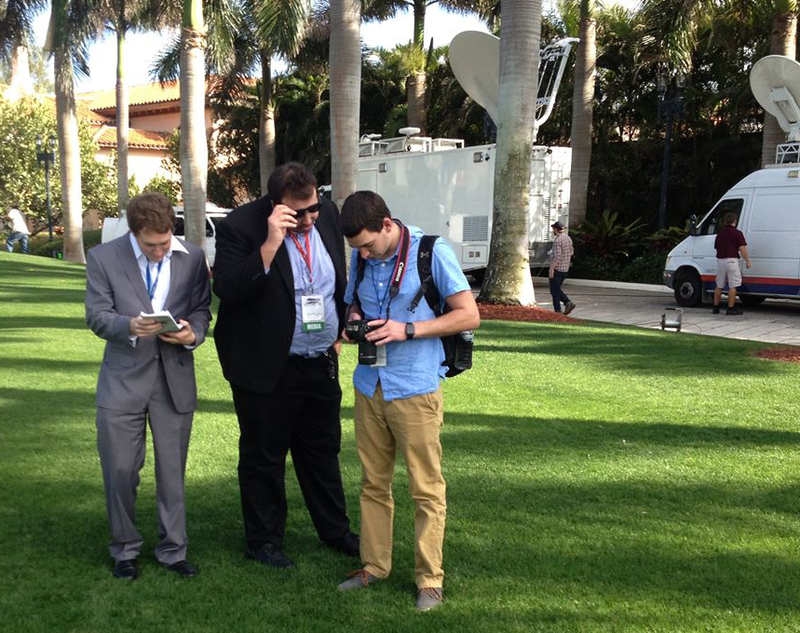 Coverage amidst the Palm trees: (from left) Ryan Teason, Aaron Broghamer and Brent Primus. Donald Trump, Hillary Clinton, Ben Carson and Marco Rubio dropped by the neighborhood the other day along with the national and international press. Providing news coverage were The New York Times, CNN, a Japanese TV network… and journalists from Palm Beach Atlantic University in West Palm Beach, Fla. These days PBAU journalism students are covering national politics for the campus press and the nearby Cox daily newspaper and building portfolio credits along the way.